A couple of weekends ago, Bob and I made a break for freedom, leaving our little man with his grandparents for the weekend. 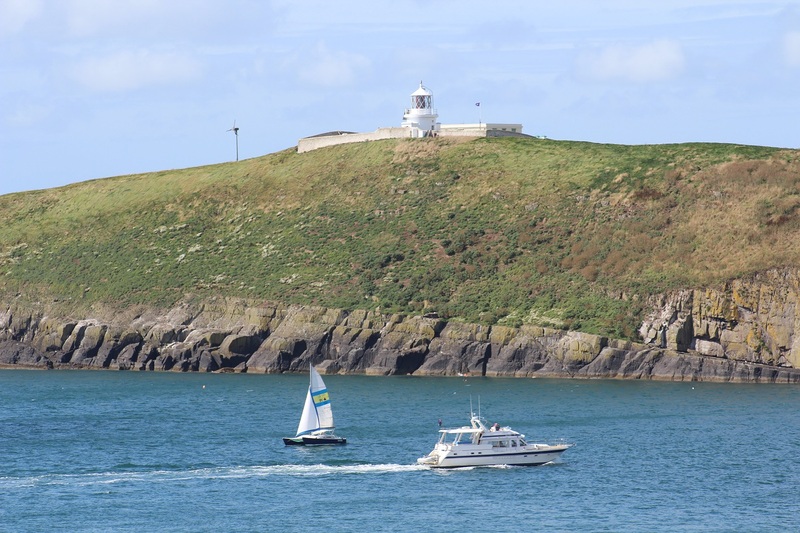 The purpose of this trip was to spend some time in Wales, particularly for a boat trip out to get a closer look at the lighthouse on St Tudwals Island West off of the west coast. A hill-bagging friend of ours had arranged the trip with the owner of St Tudwals Island East who had kindly agreed to take us to his island. Due to it being August, the owner of the West Island (Bear Grylls) was staying on the island and, understandably, very much likes some privacy with his family. That meant it wasn’t possible for us to land, but Carl did take us on a spin around the West Island so I could get a good view of it. Carl, who co-owns the East Island, was telling us that he suspects the St Tudwals lighthouse may be discontinued shortly, which would mean that Bear Grylls would inherit a lighthouse. Lucky him! It’s an attractive little structure. We spent a short time on the East Island, enough time to wander up to island high point for Bob and to take a stroll around some of the coast there – with some nice views across to the lighthouse too. What amazed me most though was the small house that sits on the east side of the island. From the outside it doesn’t look like there’s much going on, but as soon as you step inside there are tables, decorations aplenty and even an upper floor with a double mattress! It’s a great little island and the owner is full of some amusing stories. He described how he went about getting large stones airlifted onto the island for a stone circle he set up there about 10 years ago. It was a really enjoyable trip and the weather was absolutely perfect. 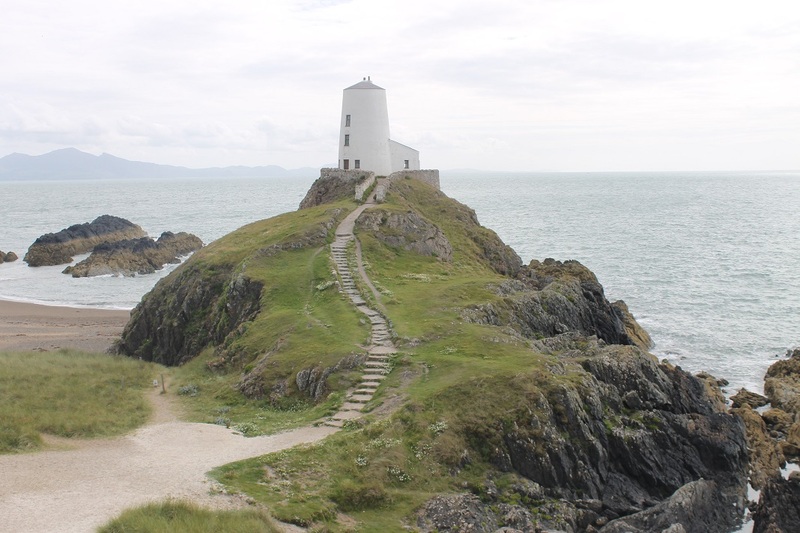 During my tour in 2012, I attempted to visit the lighthouse on Llanddywyn Island off of the south coast of Anglesey. Officially its not a tidal island, but many (and the name itself) would tell you otherwise and, when I visited before it was spring tide time so the tide was particularly high and access to the peninsula was not possible. This time we were able to time our visit perfectly so we arrived as the tide was retreating. From afar it didn’t look like there was much to it, but it’s actually a great place to explore, with paths leading out to the beacon at the very end. The old lighthouse there is really interesting in that the light was displayed from the base of the structure, rather than the top. I think there is often confusion over which is the lighthouse out of the two as it would be easy to miss the old lamp room in the lighthouse if you’re looking for it at the top. There’s a lot of history surrounding the island (sorry, peninsula) and a great deal of information on display around the island relating to pilgrimages. After leaving the island, we noticed some wooden poles on display near the car park with various carvings on top and one of them was clearly a carving of the old lighthouse. As the weather was so good that weekend there were plenty of people around on the beach, but not so many taking the walk out to Llanddwyn Island, which made it much nicer. 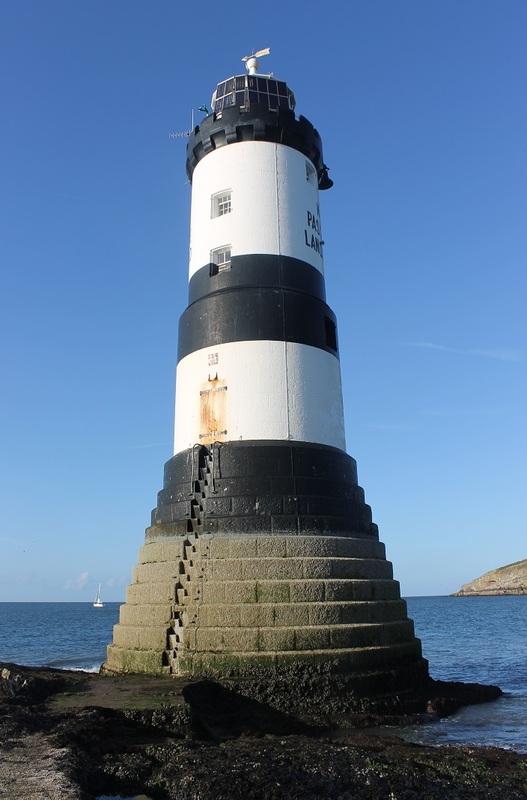 We had a little time to spare that day before dinner, so Bob suggested going along to Penmon Point to see the black and white lighthouse there, which I’d visited on my tour in 2012. As we followed the coastal road north it was clear that the tide was quite far out, so we were hopeful that we would be able to walk out to the lighthouse for a proper “bag”. I was very amused when we arrived and Bob, excitedly, when dashing off towards the lighthouse. We managed to get right out to it and Bob, as usual, chose to climb up to the door using the very cleverly built footholds. It wasn’t too busy there either so we only had to share the lighthouse with a couple of other people. There’s nothing worse than crowds of people when you’re trying to get a good picture! On the Sunday we headed home, but first we needed to get at least one lighthouse visit in, considering it was International Lighthouse-Lightship Weekend! I’d read online that both Leasowe and Bidston Hill lighthouses would be open to the public that day, so it was an opportunity not to be missed. We had a bit of time to kill before Bidston Hill opened, to we had a quick look at Leasowe and then drove along to Hoylake. When I’d been there in 2012, I’d seen the lighthouse (or what I thought was the lighthouse) so this was an opportunity for Bob to see it too. We had a quick stop there and then went on to Bidston Hill. It’s not one I had seen before, so it was an added bonus for me to actually be able to get inside it too. We arrived just in time for the first tour of the day, which was run by Stephen Pickles who is an active member of the Association of Lighthouse Keepers. I had, in fact, received an email from Stephen shortly before that weekend asking if I would be interested in preparing a piece on my favourite lighthouse for their journal, Lamp (more on that later in the year). It was a really interesting tour and you could tell that Stephen is not only the owner of the lighthouse, but has a real fondness for its history too. There are some fascinating stories about how they would go about informing the port authorities at Liverpool that a boat was on its way in. There was a group of amateur radio guys halfway up the lighthouse, chatting away to others around the world as part of the Lighthouse and Lightship Weekend. We were fortunate enough to get into the lamp room at the top of the lighthouse, which boasts panoramic views of the surrounding area and out to sea. Sadly, there is a lot of damage to the panes of glass in the lamp room. They suspect someone has been shooting at them from outside and they are currently looking to replace the panes, which isn’t going to be cheap for them. Why anyone would do such a thing is beyond me. We had a chance to speak to Stephen and his wife for a while after the tour and got a stamp for my lighthouse passport. 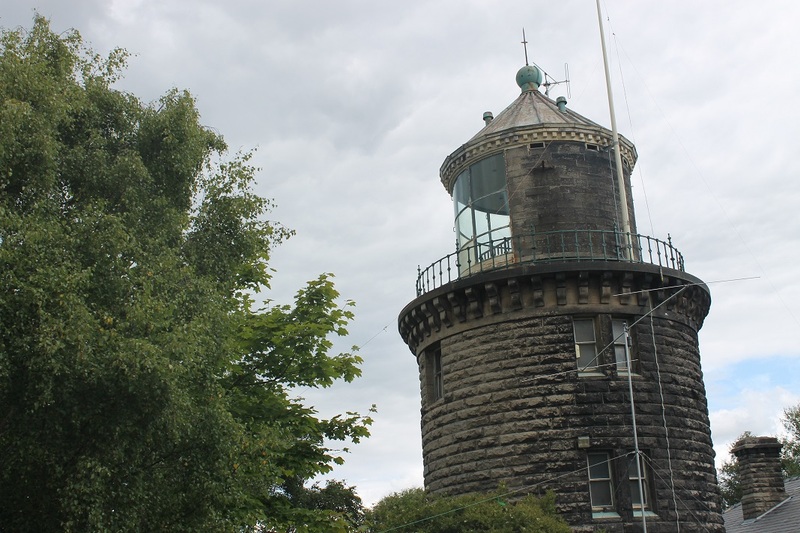 It was during our chat with them that we found out that the building we’d seen at Hoylake is actually a lighthouse folly and not the actual lighthouse. So, we will need to head back there again at some point. Thank you, fascinating to read and see all the pictures. These remote places exert a powerful pull. My wife and I used to visit Scotland, and do all the tiny lanes leading out to distant bays and headlands. Thank you Mike. These is something a bit special about a remote lighthouse. I’m pleased you enjoyed the post.